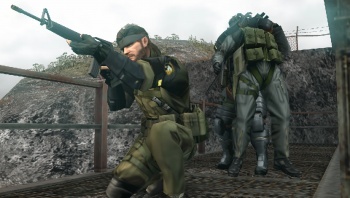 Konami has revoked Kotaku Japan's invitation to the launch event for Metal Gear Solid: Peace Walker after it published an article suggesting that there was something fishy about its perfect score in Famitsu. A perfect forty out of forty in Famitsu is pretty rare, so rare in fact there have only been 13 in the magazine's 24 year history. The recent 40 handed to Metal Gear Solid: Peace Walker takes the total up to fourteen, but not everyone is convinced that the game came by such an accolade entirely honestly. In an editorial, Kotaku's Brian Ashcraft pointed out that Hirokazu Hamamura, the former Famitsu editor-in-chief, and the current president of Enterbrain had appeared in a number of ads for Peace Walker and that the magazine actually appeared in the game, and suggested that there might be a conflict of interests. Kotaku Japan published a translated version of the article, and in response Konami and Famitsu both contacted the site and Konami revoked its invitation to Peace Walker's launch event. This isn't proof of any shady or underhanded goings-on, but doesn't really help either Konami or Famitsu one bit, especially not when you consider how often the gaming media gets accused of being on the take on a good day.